As some of you may know, Elvis Presley is alive and well and lives in a room in my house. Every week we choose a restaurant in The Bay Area and eat, drink, and talk about the old days. We each review the restaurant from our unique perspectives. Our first review is of Barclays Pub in the Rockridge neighborhood of Oakland. I was craving something British to eat, and Elvis wanted some comfort food. Elvis still loves cheeseburgers and fries, but was reluctant to be seen eating fried food as he felt it re-enforced a negative stereotype regarding his eating habits. Of course he didn’t really say it like that; I’m translating. Elvis is 74 now and still drawls a little and cusses far too often for a man that grew up singing gospel music, but far from being an older caricature of his former-self, he looks quite distinguished with short gray hair and is in fairly decent shape. I assured him that no one would make fun of him, as everyone in the world believes he died in 1977. We pass for a sort of “Odd Couple” version of a father and son. I ordered the Fish and Chips. The fish was a beer-battered Pacific Snapper. The portion was huge. I joked to Elvis, “We’re gonna need a bigger plate.” A reference to the movie “Jaws.” Elvis just looked at me with a confused look on his face. “Why don’t you just ask for one, then?” he said without a trace of a recognition. “No, it’s from Jaws, Elv…I mean, Alan.” I call him Alan to reduce the chance of anyone recognizing him. It was also his codename at Graceland. Elvis’s burger finally arrived (he’d sent it back twice claiming it still wasn’t cooked enough. Personally I think that this sort of behavior is unacceptable, but who am I to argue with Elvis Presley?) He’d ordered it extra well done. “That mad cow disease is all well and good for you limeys, but I ain’t dying over it.” Elvis is a bit paranoid, and the burger came back from the kitchen looking like a hockey puck but he was satisfied and ate voraciously. My fish was tasty and moist. The chips, which claimed to be cut English-style, were very good, but not quite fat enough to pass. 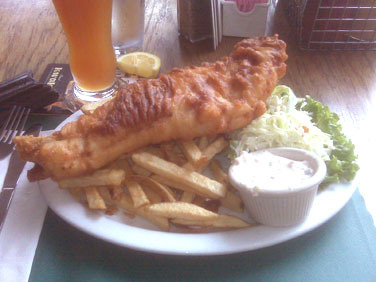 The chips in a “fish ‘n’ chips” dish should be the size of a thumb and a little soggy. They should be piping burn-the-roof-of-your-mouth hot and doused in salt and vinegar. “I don’t know. I think that’s a bad idea, pal.” He pulled a sour face after I shot down his suggestion. Overall it was a good effort for an American British-style pub. I paid the bill and Elvis said he wanted to leave the tip. In the old days he’d do things like leave the keys to a Cadillac if he thought the waitress was cute. Fortunately for us, he doesn’t have that kind of money at his disposal anymore.